You can dress me up, but you can't take me out. We were all set on going out this Friday night. I even got dressed up for work so that we could go to Grotto. But I got so caught up at work that I forgot to make a reservation. Me, without a reservation on friday night -- it's unbelievable what Distributed Computing Toolbox can do to you. When I finally called Grotto at 4pm, they were booked. After considering our other dining out options on this freezing Friday night, Jason and I decided to go home, open a good bottle of wine and make pizza. As usual, I cheated with the dough and stopped by Stella's pizza in Watertown to pick some up. To tell you the truth, I couldn't make better pizza dough if I tried. Jason is saying that even he couldn't make better pizza dough if he tried, and that's saying something (see his bread journal for more info). I cooked some dried figs with thinly sliced Moroccan lemons, balsamic vinegar, honey, and rosemary to get them soft, sticky, and deliciously savory. Rolled out the pizza dough, topped it with caramelized onions, sticky figs, Bosc pear that I meant to use for some days now, dried cranberries, pinenuts, mozzarella, and Great Hill Blue Cheese. This pizza sounds enticing. Can you post the recipe? Pretty please. What was the distributed computing toolbox that got you so distracted? I am a usability engineer at the MathWorks (makers of MATLAB), and Distributed Computing Toolbox is one of the products that I work on. I was just starting to explain what Distributed Computing was, but then I took a look at your blog and realized that you don't need an explanation ;) If you are at SC '05 right now, say "hi" to Loren, Silvina, Narfi, Arjav, Jauhar, and all the other MathWorks folks for me. Just curious - how did you find my blog? mmm, Stella's Pizza - that's something I miss from our Watertown days! 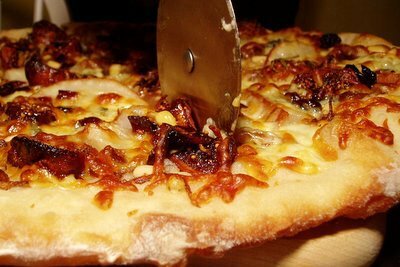 This Pizza sounds great - Stella's yummy crust with more upscale toppings.